I struggled with the title. I really couldn’t think of a good one to encapsulate everything I wanted to write about. I’m typing on my phone. Ah, the wonders of modern technology and ubiquitous free WiFi. My husband snores indelicately next to me and DD is sitting on her bed watching The Big Bang theory, also courtesy of free and fast WiFi. We are tuckered out after sightseeing for most of today and a big, late lunch. Belgium, like most of Europe, does its main feasting session on the 24th evening. So come 6pm, it’s pot noodles and some questionable clementines. I jest. The pizza place is open. We’ll be fine. DD is miffed that we forgot to bring gifts with us, even though we’d opened most of ours already (in London). Enter caustic mother who reminds her kindly that there will be children getting zilch. This season brings out a lovely colour in me. I get frustrated by the guilt hemming me in from every quarter, exhorting me to do more, give more. Brussels has been a good antidote. Everything seems to be running as normal. No last minute crazed shoppers. No panic buying. Just lots of glühwein and waffles at the markets. 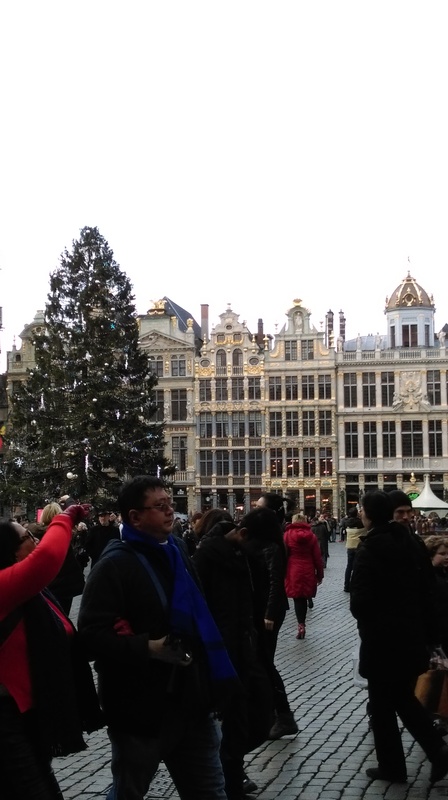 Perhaps I’m just a tourist looking in, and there are hordes of people looking for the last minute Belgian equivalent of cranberry sauce or gravy granules. But the general vibe seems to be quite relaxed. (Yes, I’m wilfully ignoring the many armed guards I’ve seen patrolling the streets. I’d like to think their visibility might deter any potential stupidity). I’ve digressed, haven’t I? I wanted to talk about gifts. The gifts which don’t come wrapped. Like time, and laughter. Focus on the people you want to focus on. Let the other stuff go. When you give a gift, let that go, too. You can’t control the emotions of the receiver, just focus on your emotions when you bought the gift. When you wrapped it. DD gave a homeless man a clementine from her stash the other day. She wasn’t expecting anything in return. She just let the clementine go. I wish I could be more like that. Just let the clementine go. Not expect things in return. Not base my peace of mind on someone else’s approval or acceptance of my gifts. Whatever they may be. I’m going to end this by wishing you a happy supermoon tomorrow night, wherever you may be. I hope you enjoy most of the people, most of the food and most of the gifts. Hey, I’m realistic. Happy Christmas to you and yours too! And a very merry Christmas to you and your family too. Have you found the chips and mayo yet – yummo!! Several times! Have taken to walking miles to burn it all off. I’ve had this post up for weeks now – keep forgetting to comment. Just wanted to say that I loved this one and hope you had a wonderful holiday!! We had a really lovely time, I feel replenished.